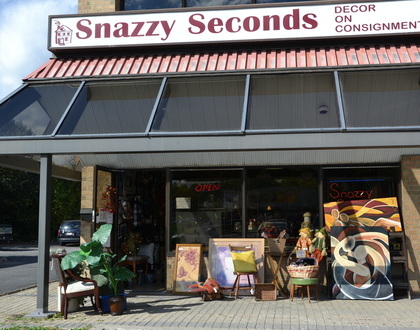 At Snazzy Seconds, you will find furniture, antiques, lighting, jewellery, dishes, throw pillows, linens, kitchenware, pottery, crystal & much more! Add gorgeous, wonderful pieces to your home, cottage or office, for a fraction of retail prices. Every piece is unique ~ over 3000 consignors bring in hundreds of new items every week. ​No appointment necessary, bring items in anytime and we will set up a an account for you. After it sells, take the cash or use it as a store credit. Sorry, no drop offs on Sundays. Venez nous visiter, nous pouvons aussi vous servir en français. Drop by and see our new look! I can't thank our loyal customers and consignors enough for helping make this business a success! Although you may not see me in the store often (I usually work every other Saturday), my husband and I are involved daily and love what we do. The consignments that you bring in on a daily basis are of fantastic quality and we're always surprised at the wide range of different items, from all over the world, in all different tastes. We're gearing up for another busy fall season and now accepting holiday decor items and so much more. Looking forward to seeing you in the store. Canadian small businesses are crucial to Canada’s economic success. They are responsible for creating millions of jobs across the country. Small business entrepreneurs are powering our economy through innovation, job creation and new, exciting ideas. Canada would not be the same without our small business owners. Our economic success depends on them. ​Check your account balance! Vérifier votre compte! ​Click here to log in with your consignor account number to find out what you've sold.